The Centre for Jazz and popular music proudly presents the first Twosday gig with Qadasi & Maqhinga on Tuesday 26 February 2019 at 18:00. 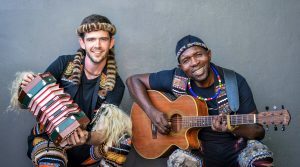 David Jenkins, also known as Qadasi, is an accomplished Maskandi guitarist, concertina and banjo player who developed a deep passion for Zulu culture and music at a young age. This interest grew exponentially over the years, and as a result, his love for traditional music was born. Well-travelled, he has performed to audiences in several countries, including Zimbabwe, England and the USA and throughout Southern Africa, sharing stages with top artists such as Hugh Masekela, Ladysmith Black Mambazo, Phuzekhemisi and Soul Brothers, to name a few. He is presently most well-known for his key role as the guitarist in popular Maskandi group, Shabalala Rhythm. David first met Maqhinga in Durban in early 2010 when enquiring about a concertina tuner. After a ‘jam session’, thus began their story and the two have become firm friends, with Maqhinga taking the role of music director and producer of David’s first solo projects. The talented musicians later decided to join forces after realizing the musical potential that was possible by combining their artistry.